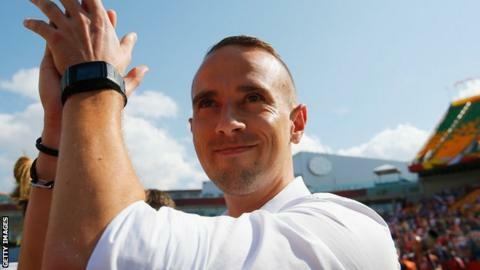 England women head coach Mark Sampson has agreed a new two-year deal which will include the 2019 World Cup. The Welshman, 33, took the Lionesses to third place at the World Cup in Canada last summer. He said: "It is an honour and a privilege to manage such a fantastic group of people who represent their country with incredible pride and passion." Sampson came third in Fifa's women's football world coach of the year award. He lost out to US World Cup-winning coach Jill Ellis at the Ballon d'Or ceremony in Zurich on Monday. Norio Sasaki, coach of runners-up Japan, came second. England lost their World Cup semi-final to Sasaki's Japan in Canada last July after a last-minute own goal, but did beat Germany to take third place. Sampson, who took charge in December 2013, has seen his side make a 100% winning start to qualification for the European Championship finals in 2017. They play Belgium in their next match on 8 April. Football Association technical director Dan Ashworth said: "We're committed to the growth and development of the women's game and our focus is on creating winning England teams. "I am confident that under Mark's leadership this England team has the capability to go on and enjoy success at future tournaments." Goalkeeping coach Lee Kendall has also agreed a two-year extension.